Electoral officials sort out ballot papers at the end of presidential elections in Conakry, Guinea, Oct. 11, 2015. 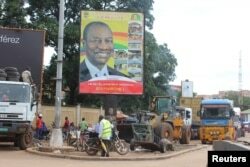 Guinea is waiting for the outcome of last Sunday’s presidential election. Whoever wins will be faced with rebuilding an economy battered by the country’s Ebola epidemic. Guinea is home to one of the world’s largest untapped sources of iron ore, along with stores of other minerals such as bauxite. But after decades of dictatorship and military rule that only ended in 2010, the country is poor. Over half the population lives in poverty, according to the World Bank. President is asking Guineans for a second term. He ran against seven candidates, including three former prime ministers in last Sunday’s vote. Full results are not expected until Friday, but the two main opposition parties have already withdrawn, alleging fraud. People pass in front of an electoral campaign poster for incumbent President Alpha Conde in Conakry, Guinea, Sept. 10, 2015. Still, many in Guinea hope that whoever comes next will develop the country. Student Vamba Camara said he wanted the country to develop. It did not matter who wins, he said and he just wanted development. While the country’s economy grew modestly in the first years of Conde’s presidency, that growth ground to a halt when an Ebola epidemic broke out in 2013. The virus has killed more than 2,500 people in Guinea. The World Bank predicts the country’s GDP will shrink by a third of one percent in 2015. 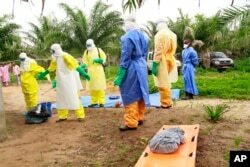 FILE - The wrapped remains of a new born child suspected of contracting the Ebola virus, lays on a stretcher as health workers, dressed in Ebola protective gear, move the body for burial in Dubreka, Guinea, June 19, 2015. Perhaps no sector is as important to Guinea’s future as mining. The Simandou iron ore deposit in the country’s southeast is one of the largest untapped sources of that mineral in the world. Former Finance Minister Ousmane Kaba said Ebola slowed efforts to start exploiting the ore.
“Only Simandou project can change completely Guinea,” he said. Guinea has now gone two weeks without reporting any fresh cases of Ebola. Kaba said it would take longer to get the economy back on track. “I think within six months. We’ll get rid of Ebola completely in three months, and three other months for the people to come in,” he said. But which president will preside over this expected recovery remains to be decided.